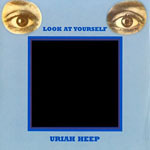 Share the post "Album review: URIAH HEEP Reissues (Look At Yourself, Demons And Wizards, The Magician’s Birthday)"
As we opined when reviewing the first tranche of Heep reissues, we would question the merits of adding a second disc with the “alternative” album version as reimagined by Heep fan and collector Robert Corich under the watchful eye of the band’s Mick Box. These can only be of interest to real completists. These three albums marked something of a golden and productive era for the band – with an album release almost every six months. However in the ensuing years they hit the skids. Thain died in 1975 from a drug overdose and charismatic vocalist David Byron was fighting alcohol abuse. 1973′s ‘Sweet Freedom’ was a more commercial offering and gave them their first U.S. album success whilst 1974′s ‘Wonderland’ is generally considered to be lack-lustre but no doubt both will appear in the future with the ubiquitous alternative versions. All the original album discs have been remastered and there are new essays and interviews with Mick Box and Ken Hensley. Heep fans might grit their teeth over this constant recycling although they offer a reasonable catch-up to newbies. The band’s mix of heavy rock and prog was at its zenith during these years. This entry was posted in ALBUM REVIEWS, ALBUM REVIEWS (Mobile), All Posts, Reissues and tagged album, classic rock, Demons And Wizards, expanded, heavy rock, Ken Hensley, Look At Yourself, Mick Box, prog, progressive, reissue, remastered, review, The Magician's Birthday, Uriah Heep. Bookmark the permalink.